Traditional Italian Florentine papers inspired by the Renaissance period feature stunning colors, intricate designs and gold accents. The Manuscript design displays scripts, writing and miniature illustrations against a cream background. 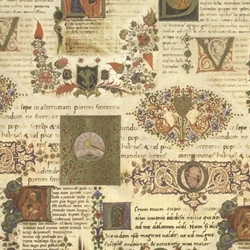 The Italian Florentine Renaissance Manuscript resembles manuscripts from the Renaissance period featuring decorative initials and miniature illustrations.